My take: Destiny Mills is in Fool’s Gold for the summer. She works for a company that provides software to search and rescue departments in the US and Canada. The mayor of Fool’s Gold hired her to work with the local S&R team. Kipling Gilmore was a world-class skier until an accident changed his life. He’s lucky to be alive much less able to walk. The mayor hired him to head up the S&R team in Fool’s Gold. Both Destiny and Kipling had less than desirable upbringings. Destiny’s parents are country music stars who divorced after a tumultuous marriage. Both went on to have several partners resulting in more children. Until their divorce and Destiny (age 10 at the time) went to live with her grandmother she’d never felt secure, much less loved. Kipling was raised with a violent father who said all the right words but his actions said other. He was able to leave that life when he moved in with his ski coach and family but he felt guilty leaving his sister to bear the brunt of their father’s anger. It’s no wonder neither Destiny nor Kipling think they can have a normal relationship – they don’t think they are capable because it was never modeled by the adults in their lives. These two had a lot to overcome. Being a romance novel the reader knows there will be a happy ending. I have to say while I really liked the main storyline of Hold Me I found the secondary plots almost silly. But, this a series I enjoy so I’ll continue to read the books as they are published. I’m hooked. 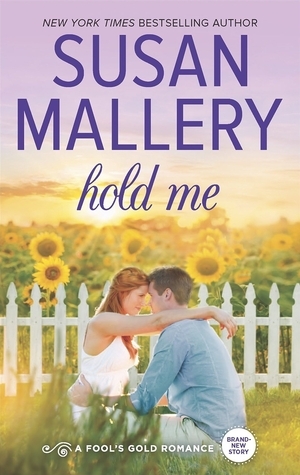 I recommend this book to fans of the Fool’s Gold series, small town romance, and Susan Mallery. I enjoy sweet books like that from time to time.